Easy 4 pitch climb on breccia tuff. Long drive (3.5hrs) from Seattle. Long drive from Seattle - about 3.5 hours. Road conditions fine except the last 2 miles on NF-77. Thanks to Sherrie Trecker's informative trip report, we had it pretty easy. The well bolted route was easy to follow. We used a mixture of quickdraws and extended alpine draws and only the first rope lead built the anchor which were left and used by the following 2 teams. We (group of 6) started climbing around 12:30pm and the first team reached the summit around 3:30pm. Beautiful views of St Helens, Rainier, Adams, Goat Rocks and even Hood from the summit. Had to look around for the rappel anchor which was on the north end of the east face. It was further north than anticipated so took us about 15 minutes to find it. We started rappeling around 5pm and back at the cars around 6:30pm. We did 2 rappels instead of a double rope rappel to avoid having the rope get stuck. The 2nd set of rappel rings were on a sandy bench on climbers right just as Sherrie advised. Nice dinner at Big Bottom Bar and Grill in Randle ended the climb well. As Sherrie noted, don't understand why it's considered a rock or alpine climb. 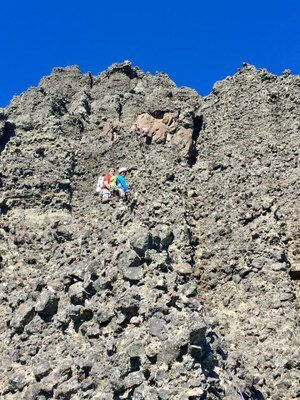 It's more of a crag climb with all the bolts, bolted anchors available and about 10-15min walk to the base of the climb.